By: M.StefanRecently, my wife and I were in Spain and spent a wonderful day tasting and touring in the Penedes region outside Barcelona. If you ever get a chance to do this, I highly recommend it. A 30 minute train ride takes you from the Barcelona train station to the front door of Freixenet. There you can tour that winery as well as several other of their “sister” wineries. If you have never seen how sparkling wine is made, it is a real enlightening and educational experience. Not to mention a treat for the palate and taste buds. One of those sisters is Segura Viudas. 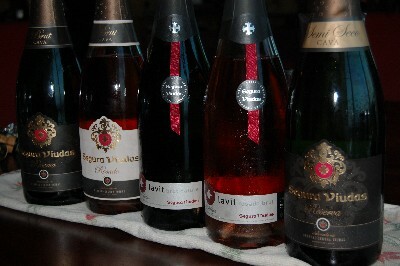 While not as well known, Segura Viudas offers a selection of cavas in all price ranges and styles. Always a great deal in bubbles! These wines are distributed by Varela Hermanos and are widely available. Very fresh and light. Refreshing, tiny bubbles. Complex and rich. A bit of grass on the nose. Earth and oak. Lovely pink color, medium body. Berries, cherries and other fruit. Dry, fresh, fuller flavors. Tropical fruit in the nose. Excellent wine in an off-dry style. Nose of fresh grass, fruit and finishing with a rich, round feel. Excellent, full flavored and dry. Nearly as good as French Champagne and a fraction the cost! M. Stefan has over 25 years experience in the wine trade and has traveled extensively throughout the wine producing regions of the world. His column is a regular feature of La Playa Community. He can be reached at mark@playacommunity.com and appreciates your comments.